Look at all those sensors! Photo: TK Tech News. The Motorola Moto X+1 has been pictured again ahead of its official unveiling this week, revealing a number of mysterious sensors positioned around its display. New information on the device also indicates that the Motorola logo on its back will be a shortcut button that users will be able to reprogram to their liking. The images come from TK Tech News, who has been incredibly reliable with previous leaks — such as the Galaxy S5 Active — and it gives us a clear look at the front of the Moto X+1 ahead of its official debut this Thursday. While we have seen the Moto X+1 before, this is the first time we’ve gotten a look at those sensors around its display. There are four altogether, and they look a lot like the sensors used to provide 3D effects on the Amazon Fire Phone. But what will the Moto X+1’s be used for? Well, according to sources for TK, 3D effects are one possible option. The other possibility — the seemingly more plausible one — is that the sensors will work with Moto Alert and the Moto 360 watch, but it’s not completely clear what exactly they will do just yet. 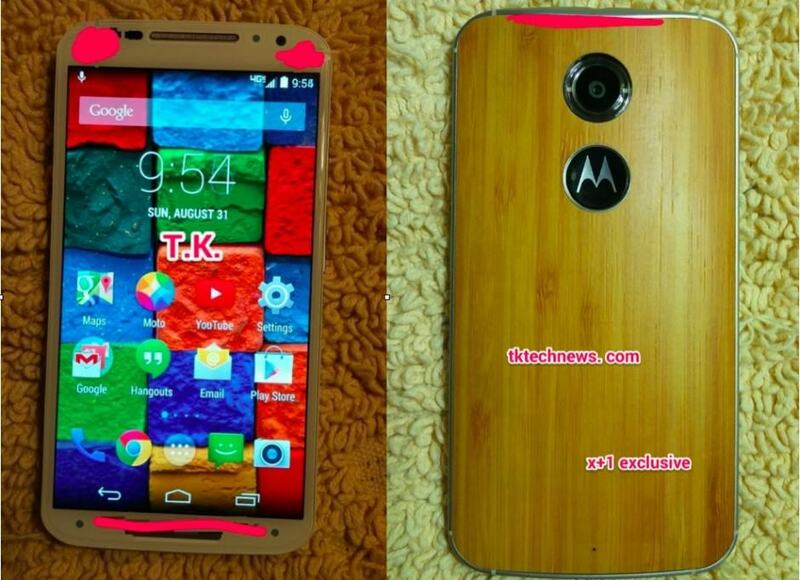 We’ll need to wait until Motorola’s event to find out. TK also reports that the Motorola logo on the back of the Moto X+1 will actually be a power button that users will also be able to customize for other things, such as a camera app shortcut. The device will reportedly have an aluminum frame and interchangeable backs will be available in wood, plastic, leather, and denim. TK adds that there will also be an “all carbon fiber” handsets that’s expected to be a Verizon exclusive.